A post that takes a few moments to reflect on the realm of geekdom, on making blogging part of one’s lifestyle, and commentary on how I view my progression on The Uncommon Geek. Just to get it out of the way, I did decide to put a picture of myself right in the headline. It is, I believe, only the second one that has been put to publication on this site. I tend to be very private about myself and what I put on the interwebz, which I know, does run counter to writing a blog and sharing one’s thoughts with the world. 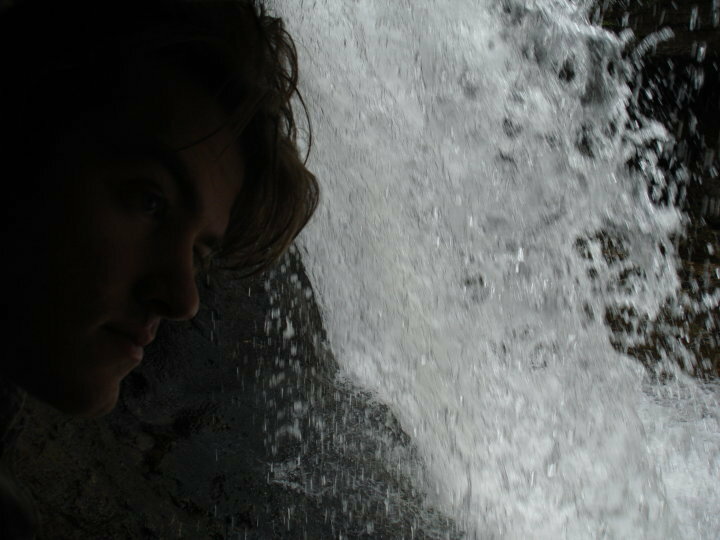 But I figured that this time, considering the nature of this article, a picture of me being thoughtful underneath a waterfall would be a pretty good way of visually summarizing my state of mind. So just what is this pensive post about, then? I felt an urge to write about what is, effectively, a “behind the scenes” look at my work on The Uncommon Geek, and how it has come so far in such a relatively short time. In writing for this blog, I have learned not to fight such urges when they come about, because it is in following my creative and instinctive urges, that I have written my best work. When I first approached The Uncommon Geek himself, about possibly contributing to his site, I did so with the hope that by committing myself to such a project, I could kick my writing back into gear. Other than works I made for college, I had allowed my writing to severely lapse. I had so much that I wanted to put out there, yet felt totally helpless when it came to actually putting my thoughts and feelings into words. Drama and severe depression in my personal life crippled my creativity and had broken my spirit. It wasn’t until the fateful conversation I had with Boss Monkey at our local cafe, Eclipse, which was all about time travel, warp field theory, and the persnickety details of a Constellation-class starship, that I realized how much I needed to geek-out. I used to have a personal blog in the pre-Uncommon Geek days, but it was poorly maintained and I seldom posted anything. Even though it has been less than a year since being welcomed into this extended Geek family, it is amazing to look back on how it has transformed. I never thought that I’d be involved in a podcast, or have the opportunity to talk to so many interesting new people in the realm of geekdom. I never expected that I would see such a positive and warm reaction to my obsession with Star Trek and classic science fiction, or that I would ever find the motivation to start reviewing video games (which has been a goal of mine for years). The kudos given to this site are humbling, and gratifying. Despite some hiccups that I am still encountering in my personal life, I am filled with what is to me, a rare sense of optimism and hopefulness about the future of my endeavor in the field of creative writing, and I also share that hopefulness about the future of The Uncommon Geek. So what does the future have in store for me, as part of this site? I don’t want to give away the whole bag of tricks, but I will say that some exciting stuff is on the horizon. This week I will be dabbling with some tech that I’ve acquired, which shall enable me to add recorded gameplay footage to my video game reviews. It has been a goal of mine for years to record a full playthrough of the entire Mass Effect trilogy, effectively making my own movie in the process. My game reviews, in writing, will continue to progress and evolve. I have been, as you may have noticed, dabbling with a scoring system. I am still experimenting with it. Part of me didn’t want to even bother with a rating system, because they are so arbitrary. But, sometimes you just need to give a game a solid, bottom line, and giving it a score is a definitive way of doing that. I also feel, as someone who has been involved in the game industry since I was old enough to hold an Atari 2600 joystick, that I have the knowledge and, arrogant as it sounds, authority to be able to accurately rate a game, in addition to writing about it. While I may be confident enough to write about and give my impression of movies or TV shows, I don’t feel like I am enough of an authority in film, cinematography, and acting to actually grade a motion picture or a TV show with a rating scale. In the interest of humility, I want to once more thank Mr. Uncommon Geek for allowing me to be part of this site, and through that participation, for kickstarting my writing back into gear. In addition to reviews and articles on geek culture, short stories, original fiction, videos, and music projects are all in the works. George Takei, for being the cheeky and entertaining fellow that you are. Seriously, you all know how to find this guy if you haven’t already. I also want to thank Podcast guest stars Andrew Shell, Matt Gibbs, Wes Krick, and Travis Fowler for geeking out with me outside of this site, and for helping me pick up the pieces of myself when times have been rough. You guys are awesome.